If ever there was an album on which AC/DC were going to make a significant shift from their sonic blueprint – the most successful blueprint in the history of popular music – this would be it. 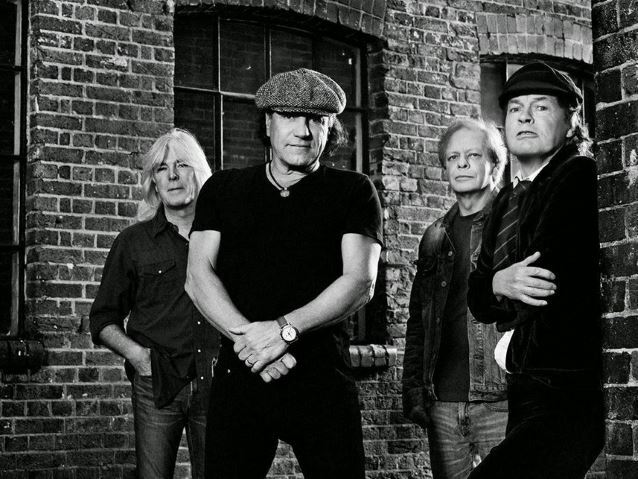 Lynchpin rhythm guitarist Malcolm Young’s illness has kept him from performing here, if not from the songwriting process, and on what looks highly likely to be their final album such a change could have been critical. To keep things short, it really hasn’t. Rock or Bust is AC/DC doing what AC/DC have done for four decades now – churn out one ice cool rock n’ roll song after another, with zero regard for contemporary trends or anything beyond inspiring goodtime feelings. There’s a reason they’ve released what is essentially the same album for the fifteenth (or sixteenth if you’re in Australia) time. It’s a damn good album. That the men who have written and performed on it are nearly all in their 60s is irrelevant and by no means apparent – this is timeless, ageless party rock that’s dumb but never stupid, and repetitive but never dull. From the opening one two punch of the title track and the swaggering first single ‘Play Ball’, the grand thematic of ‘Rock or Bust’ is a refusal to grow old or grow up, because frankly there’s no fun in that. Occasionally this creates silliness – both the lyrics and acutely annoying backing vocals of the chorus in ‘Sweet Candy’ a case in point – but the fan factor never collapses, and the momentum keeps on building. That the record is kept to 11 tracks and less than 35 minutes is a canny decision as it prevents the monotony that’s plagued recent ‘DC records from setting in, weaker songs like ‘Rock the Blues Away’ and ‘Hard Times’ carrying enough enjoyment to keep the ball rolling. The best material here is some of the best the band have penned since 1990’s The Razor’s Edge. Where ‘Dogs of War’ sets the pace slow and steamrolls on unrelentingly, punching well above its rightful weight, ‘Baptism by Fire’ leaps out the gate and immediately cranks up the energy levels towards the album’s end. For any other band, ‘Emission Control’ would be an innocuous closer – in the hands of AC/DC it’s an ironclad blues-rock monster. The uncanny knack that this collective have for taking the simplest of riffs and hooks and forging solid gold songs out of them is unparalleled, and even at their most ridiculous the lyrics hold a naïve charm. Brendan O’Brien’s rock solid production job benefits the crunch n’ roll the band have made their trademark, and even if the simplicity of the musicianship is perhaps more blatant than ever the vigour with which the songs are performed makes up for it. Rock or Bust is no Back in Black – it was never going to be, and even the most ardent of AC/DC fans will admit their best days are way behind them. But even after multiple generations imitators have come and gone, the originals remain the best and here have produced their best album in a long time. No manner of illness or legal wrangling is enough to halt this well worn but unstoppable rock machine, and as juvenile and homogenous as it can be this is an album that proves just that. If this is the end, the Aussie titans are going out with a bang (or at least as big a bang as they could hope to make more than twenty years after their last real classic record), and if nothing else provides a few more weapons for the arsenal to be unleashed on the world in one last mega tour.